Contents: Preface. 1. Introduction. 2. Brief history of mushroom cultivation. 3. Mushroom production in India and world. 4. Mushroom nutraceuticals. 5. Medicinally important mushrooms. 6. Mushroom biology. 7. Genetics and breeding of mushrooms. 8. Preparation of culture media. 9. Preparation of mushroom tissue culture. 10. Preparation of pure culture by Spore Print technique. 11. Preservation and maintenance of mushroom cultures. 12. Preparation of mushroom spawn. 13. Microbial contamination during spawn making and solutions. 14. Equipments required for mushroom culture and spawn laboratory. 15. Layout of spawn laboratory. 16. Layout of mushroom farm. 17. Cultivation method of White Button Mushroom (Agaricus bisporus). 18. Cultivation method of Oyster Mushroom (Pleurotus species). 19. Cultivation method of Paddy Straw Mushroom (Volvariella volvacea). 20. Cultivation method of Milky Mushroom (Calocybe indica). 21. Cultivation method of Shittake Mushroom (Lentinus edodes). 22. Cultivation method of medicinal mushroom (Ganoderma lucidum). 23. Identification and management of diseases of White Button Mushroom. 24. Identification and management of diseases of Oyster Mushroom. 25. Insect pests, mites and nematodes of mushrooms and their control. 26. Preservation and processing of mushrooms. 27. Preparation of mushroom recipes. 28. Economics of mushroom cultivation. 29. Auxiliary information. 30. Glossary of mushroom cultivation. References. "Mushrooms cultivation is becoming very popular because it not only meets the dietary requirements but also adds to the income especially to those growers having no or insufficient land. 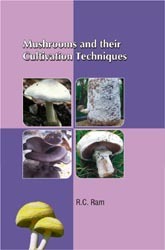 This book will provide a new sight in basic practical and applied research related to mushrooms and their cultivation techniques. This book is suitable for undergraduate, post-graduate, research scholars, senior research fellow and research associates in mycology, microbiology, plant pathology, home science, botany, horticulture, forestry, crop sciences, food sciences and biotechnology."